This entry was posted in Art, Bloggery, Faith, Friendship, Fun, Life, Money, Music and tagged "To Hell with the Devil", abalone, American, BIble app, Brazil, Christ's presence, Christian bands, Christian music, conform, courage, encore, faith walk, fans, front man, front woman, gentleman, goal, God, good, guitar pick, hairspray, hoodie, Ignescent, Isiah 53:2, Jennifer Benson, modern, music, New Testament, NIV, not alone, nun, old-fashioned, operatic, Oz Fox, praise, Robert Sweet, rock n'roll, roots, Rosary, rose petals, Sami Carava, secular, seduce, seek, share, Signature band, staying home, STRYPER, Tailgators Sports Bar and Grill, The Bible, The Lord, tour, verbose. LOVE IT!! So glad you had a blast! Wish I could have been there!! I thought of you when I got there– reminded me of how you waited FOREVER that one time we saw HBB at Bourbon Street! ❤ So you WERE there with me. You would love this band, if they ever come to Texas, go check them out!!! Thanks for reading all that. I know it was really long! It was a good night. It was nice getting to chat with you and Tammy a few times. If you need help finding Christian concerts to attend let me know. Big Stryper fan here! I was going to go that show! So cool you had a great time! Saw them at the UIC Pavilion and the Rockford Civic Center back in the day on the ‘In God We Trust’ tour. I had nosebleed seats for each but it was rockin’ just to be in the building! Definitely some the best shows I have seen, Christian rock or not. Their songs are so good they stick in your head for days! YEAH!!! You’re reading my archives, THANK YOU!!! Glad to know someone is, Richard. 🙂 Stryper IS amazing!! 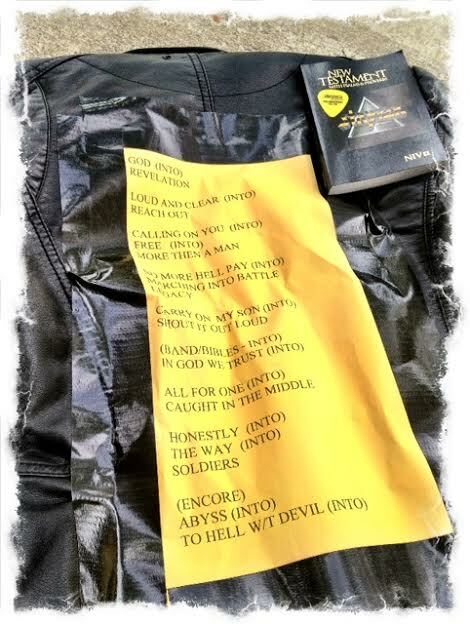 Although I eventually did take that set list off my jacket, with a little tear in the leather. I only have one CD, a Christian friend in college told me about them. “To Hell With The Devil,” is the only song I know but I need to get more of their CD’s! Wow sounds like you had a great time!! That’s awesome. What year was that?? I just couldn’t get over how professional and technically astute they were. YEAH, indeed!! This was 1988! They still wore their yellow and black costumes. I remember Michael Sweet had a real sparkly jacket and Tim Gaines wore the black, leather-like jumpsuit. Robert had to climb a pole to get to his drumset and Oz had big hair (…the eighties!). The backdrop was a huge dollar bill with ‘In God We Trust’ and the Stryper logo on it. Their sound was HUGE and their vocals were just like the record! Did I say record? I meant CD…lol!